GreehouseTruth Blog :: Antarctic Ice Thickening? While much of this year's news coverage of the Nobel Peace Prize was focused on Al Gore, one of the IPCC co-recipients of this distinguished honor, John Christy, touted a view diametrically opposed to that of the ex-VP. Christy, the director of the Earth System Science Center at the University of Alabama who also served as a participant in the IPCC, aired his antithetical views on CNN, as well as an op-ed article in the Wall Street Journal (which you can find here). Christy made it known that while news coverage has ballyhooed the melting of Artic ice in recent times, the media has failed to mention the fact that winter sea ice around Antarctica has increased enough to actually set record maximums. Coming from a distinguished climate scientist and co-recipient of the same Nobel Prize that Gore received this year, Christy's comments have provided ammo for climate change contrarians while serving as a point of contention for the apocalyptically inclined. So who is right? In the Inconvenient Truth, Gore shows simulations of what could occur if Greenland and Antarctic ice were to melt, inundating major portions of Florida, Bangladesh, and other areas residing on the brink of sea level (as we know it today). News has been riddled with similarly dire predictions as well (like this article in the Washington Post). The fact is though, as the IPCC points out, Antarctica will behave differently from the Arctic. In a warming world, Antarctica actually has less of a chance of melting. In a warming world, the atmosphere becomes heavily laden with moisture, which eventually gets deposited as snow over Antarctica, which in turn increases the mass of Antarctica's ice. Thus, according to most climate change models, although Antarctica would lose some ice from climate change melting, the melting would be offset by the extra snowfall over the subcontinent, thereby providing equilibrium and negligible loss of ice. In contrast to the Arctic, the extent of sea ice in the Antarctic has come close this year to breaking its satellite-monitored record for maximum area of 16.03 million sq km. It's funny how these things get lost in the fine-print. 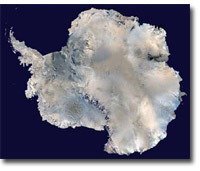 The media, although in virtual obscurity, did concede that Antarctic ice is thickening. But what's also disturbing is how many in the counter-climate-change-crowd have been guilty of not looking at the whole story either. Antarctic ice has been increasing in some areas, but decreasing in others, resulting in a virtually zero-sum loss of ice. Many reports in the journal Science* have shown that while ice is thinning in some parts of Antarctica, it is thickening in others, thereby offsetting any loss of ice to nearly zero. Other studies have somewhat conflicting results, but most still agree with the IPCC's statements that ice loss from Antarctica in a warming world would be negligible. * Even back in 2002, when the infamous Larsen B ice shelf collapsed, there were reports then that Antarctic ice was thickening. * The media though decided to cover the shock-and-awe angle, and not the true science of the matter. The same journalistic tactic has been used in recent times, not only in Gore's Inconvenient Truth portraying worst-case scenarios, but also in a plethora of articles throughout mainstream media. In the ratings game, reporters often contort analysis with "absence of evidence" (not revealing all), which is not to be confused with "evidence of absence" (where one can prove that something is or is not true). When it comes to reporting Antarctic ice loss, the scientific community has opted for the latter, the whole story. The media on the other hand has chosen the former, omission of facts. Ironically, the scientific consensus for human-induced climate change is the same that agrees Antarctic ice is not a major concern in a warming world. The IPCC holds this stance,* myriad papers written over the years corroborate this, and recent measurements confirm it as well. Climate science also concludes that evidence of a climate shift would reveal ice loss in the Arctic, but thickening of ice in the Antarctic. Since we're seeing this, we can conclude with confidence that our climate is changing. To ring the end-of-the-world alarm bell though with half-truths is a lot like crying wolf, where, dangerously, many may stop listening when the facts eventually trickle in. Antarctica, while actually showing signs of a warming world with recent thickening, is (sadly) being used in a tug of war between skeptics and alarmists alike. This, in a world that's warming and where uncertainties abound, is unfortunate. To stay abreast on similar articles like this, you can signup for the free GreenhouseTruth newsletter. Additional information on climate events, Antarctic ice extent, the IPCC reports, global temperatures, and other topics discussed in this blog can be found in Nathan Cool's new book, Is it Hot in Here?--The simple truth about global warming. Click here to get your copy.